Nowadays, many slots are released exclusively early as online casinos make arrangements with the software providers to launch their upcoming titles before they go on general release – this gives their customers the chance to play the slots early which results in loyalty. Quickspin will be releasing Big Bot Crew on the 11th of September (2018) but it can be played right now. A trio of techy teens who have created an all-powerful android are the stars of Big Bot Crew – it’s a super volatile 5 reel, 40 payline game that comes with Quickspin’s usual design excellence and some pretty funky features. The visuals have a comic book feel to them. The action takes place against an urban street scene backdrop. On the reels you’ll see lower value robot parts, 2 androids and the techy team of Matsuo, Danielle and Joaquin. They’re joined by Robotto which is the game’s wild and really comes into its own when you trigger the game’s extras. If any part of the Robotto wild hits, it could expand and turn the whole of that reel wild. If you’re lucky enough to land 2 or 3 of these on the same spin, you’ll be awarded 2 or 3 respins. The stacked wilds blast off from their starting position and can land anywhere on the reels on the respins. You can land more respins here too if fresh Robotto wilds hit. The second feature is the Free Spins feature – land 3 scatters and you’ll receive 8 free spins. Any Robotto wild that hits during this feature expands to fill the whole reel as well as adding an extra free spin to your tally. Once a stacked wild hits, it’s in play for the remainder of the feature. If you like volatile slots, then Big Bot Crew should be right up your street as the variance here is sky high – you can win over 5,200 times your stake during the Bigbot Respins feature. As usual for a Quickspin slot, Big Bot Crew is packed full of back story and looks and sounds terrific. The explosive features aren’t bad either. 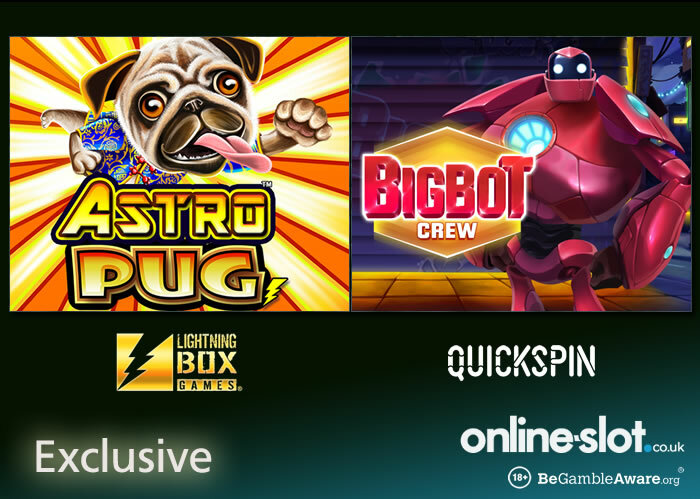 Big Bot Crew is available to play right now at ComeOn Casino – sign up to get 20 no deposit Starburst free spins as well as a 100% match bonus up to £25. Astro Pug will be released by Lightning Box Games in a couple of weeks’ time but it can be played right now. With a weird Asian/dog theme, this 5 reel, 1,296 ways to win slot has a middle reel called the Reelfacta which is made up of a block of 16 symbols. Playable from 50p a spin on all devices, you are taken to a traditional pagoda-style building where you’ll see Chinese animals. There’s a dog bones multiplier wild that appears on reel 2 and can boost your winnings by up to 4x – this is the Bone Multiplier feature. There’s also a Free Spins feature where a +1 wild or bomb lands on each free spin – the +1 wild gives you another free spin with the wild locking in position. The bomb ends the feature. If you fill all outer positions of the Reelfacta with a wild, you will enter the Mega Spin feature where 1 Mega Spin is awarded with the wilds in position. For more info, read the Astro Pug review. Before it’s general release, Astro Pug can be played at Casumo Casino – they’ve also released Thunderkick’s Jaguar Temple exclusively early. Anyway, sign up to get 20 no deposit spins on NetEnt’s Starburst as well as a 100% first deposit bonus up to £300.